Kanye West is back, and as honest as ever. While premiering his new film Runaway at a reporter- and star-studded premiere screening in Los Angeles last night, the rapper revealed that he had, at one point, contemplated taking his own life. "There were times that I contemplated suicide," West told the crowd, adding that he is now certain, "I will not give up on life again." "There's so many people that will never get the chance to have their voice heard...I do it for them." West did not reveal when his life-taking thoughts occurred, and whether his low point came during his past tumultuous and rather media-bullied year or earlier in his life. He did, however, reveal that he has had to bury three parental figures, including mother Donda West, in the past three years. "Everything has been taken away from me," the 33-year-old said. "I'm so not…scared. I so don't care." West's extremely personal disclosures came as the rapper premiered Runaway, a 35-minute mostly dialogue-free film that uses nine new Kanye songs and features model Selita Ebanks as a fallen phoenix and West himself as a griffin. Ryan Phillippe, Pete Wentz and Morgan Spurlock were among those in the audience for West's directorial effort. 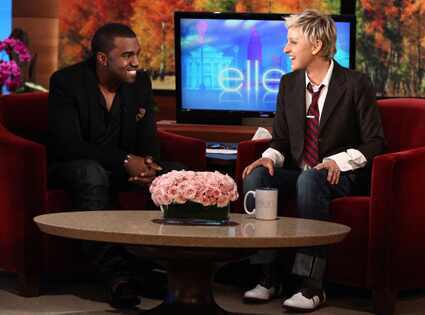 Earlier this week, too, Kanye's return to the fore of pop culture included no less honest a surprise stop at the Ellen DeGeneres Show. "I left America," he explained of his suddenly (and understandably) MIA whereabouts after Taylorgate. "I stopped doing music all together. I just took some time. I went to Japan just so I could get away from paparazzi all together. Then in November I moved to Rome and just lived there and when I came back to the states I moved to Hawaii. I lived there for about six months and just worked on music." The time away was much needed, as it allowed West, for the first time, to truly mourn his mother's much-publicized passing. "I had never stopped and tried to even soak in what all had happened. It was the first time I had stopped since I had made it. Since I had started. It was time to take a break and develop more as a person as a creator and focus more on my thoughts and my ideas and what I wanted to bring to the world." "For your whole world to completely crash off of a moment of sincerity or alcohol or whatever it is…I feel like in some ways I'm a soldier of culture. I realize that no one wants that to be my job and I'll never go onstage again. I'll never sit in an awards show again. "Will I feel convicted about things that really meant stuff to culture that constantly get denied for years and years? I'm sorry I will. I cannot lie about it to sell records." That's OK. Being honest about it to sell records is much preferred.